For the first time in a year, homeowners with adjusting mortgages are facing rising mortgage rates. 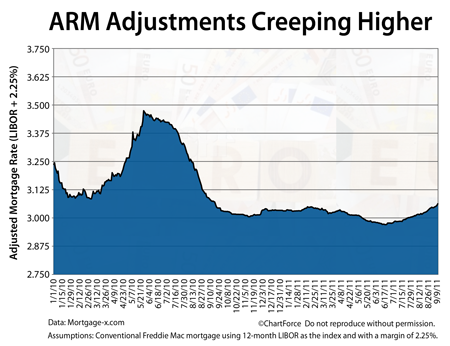 The interest rate by which many adjustable-rate mortgages adjust has climbed to its highest level since September 2010, and looks poised to reach higher. This is because of the formula by which adjustable-rate mortgage adjust. Each year, when due for a reset, an adjustable-rate mortgage’s rate changes to the sum of fixed number known as a “margin”, and a variable figure known as an “index”. For conforming mortgages, the margin is typically set to 2.250 percent; the index is often equal to the 12-month LIBOR. LIBOR stands for the London Interbank Offered Rate. It’s a rate at which banks lend to each other overnight. LIBOR has been rising lately, which explains why ARMs are adjusting higher as compared to earlier this year. There has been considerable stress on the financial sector and LIBOR reflects the uncertainty that bankers feel for the sector. LIBOR last spiked after the collapse of Lehman Brothers in 2008 amid global financial fears. Analysts expect LIBOR to rise into 2012 because of bubbling concerns in the Eurozone. Despite LIBOR’s rise, though, most adjusting, conforming ARMs are still resetting near 3 percent. For this reason, homeowners with ARMs in Tennessee may want to consider letting their respective loans adjust with the market. This is because an adjusting mortgage rate near 3 percent may be better than what’s available with a “fresh loan” — even as 5-year ARMs rates make new all-time lows. Unlike a straight refinance to lower rates, an adjusting loan requires no closing costs, requires no appraisal, and requires no verifications. So, if you have an adjustable-rate mortgage that’s set to reset this season, don’t rush to refinance it. Talk to your lender and uncover your options. Your best course of action may be to stay the course.